Create any type of CELEBRATION project. I decided for my celebration project I would share my daughters birthday party invitation. My oldest daughter Alivia's birthday is on Christmas day. We celebrate it early so her friends can attend, this is the card/invitation I made for her 10th birthday party. 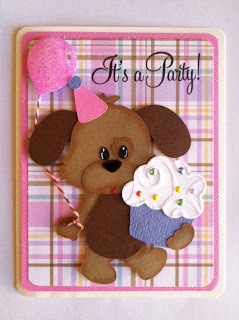 This is from Kadoodle Bug Designs Birthday Party Dogs. I used glitter on the balloon and tied it to his hand with twine. I did add some "sprinkles" to the cupcakes by adding Liquid Pearls. Super cute invitation. Happy Early Birthday to your daughter. My sister and her two girls were born in December. Busy month! Cute puppy dog & sweet treat card. Happy Birthday/Christmas to your daughter. My daughter's 21st birthday is 12/27. For her 10th Birthday we had a Harry Potter party at the Movie Studio Grill reserving the movie theater for guests to watch the HP film. Happy Early Birthday to Alivia! !Super Duper Cute Invite! !Adorable Dog! Love your card! So cute. Your invitation is adorable. Happy belated birthday to your daughter. I hope you and your family had a Merry Christmas.